that come to us year after year. 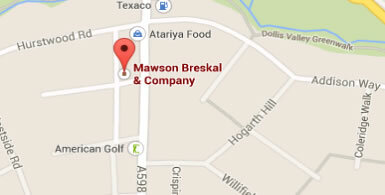 At Mawson Breskal & Co our clients needs come first. As a small family firm of chartered accountants and tax advisors we provide all round advise to businesses and individuals from compliance to tax planning. Our focus is on adding value, looking to help you enhance your profits and save tax whilst ensuring all compliance matters are dealt with in a timely and efficient manner. Whether you are a new or established business we provide you with support and guidance throughout the year with unlimited phone and email support. Our proactive approach means we will keep you informed and up to date whilst providing a quick response to any queries. Please browse our resources for free guidance, tax tips and tax calculators or for a bespoke solution to your tax and accounting needs, contact us for a free no obligation review and competitive fixed fee quote. The foundation of our business is that clients come first - we aim to provide a first class service at a very competitive rate. By establishing a close working relationship with you, we're able to offer targeted and timely advice to help you improve your personal or business finances. tax tips and news direct to your email inbox.